Spotify plans a 'new direction' – all to be revealed next week | What Hi-Fi? Global press conference on November 30th will unveil "a new direction for the company"
Now here's a bit of intrigue: Spotify has called a global press conference in New York next week, on November 30th, at which it will announce "a new direction for the company". 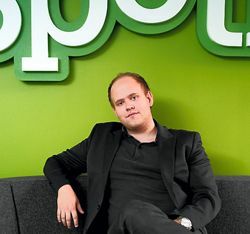 Details remain scarce, but the invite apparently says that Spotify CEO Daniel Ek (right) will be on hand "to share some exciting news", accompanied by "a special guest or two". So what could it be? An iPad app? A new interface? Spotify for movies? Further integration with Facebook? All that Spotify will say for now is that "we are holding our first press conference in New York on November 30th to unveil the latest major development from Spotify – and a new direction for the company". Looks like we'll have to wait until next week to find out more.